"My great-grandpa's name was changed at Ellis Island!" How often have we genealogists heard this statement? Sadly, this is a commonly held misconception. There is not one shred of evidence to support the claim that officials changed the names of immigrants arriving at Ellis Island. Officials not only did not have the time to start assigning new names to incoming passengers they didn't have the authority to do so. Check how many ships were arriving daily and how many passengers on average were on each one, then think about the lineups of immigrants waiting to be cleared. Yes, it’s about the math, it’s about the sheer numbers of immigrants arriving in any one day, month or year. There was no time for officials to do more than process each immigrant as quickly as possible. Sometimes an arriving immigrant used an incorrect name such as the surname of a stepfather rather than the biological father, or a name the family had adopted for other reasons. It is also important to remember that names of passengers were taken at the port of departure. These were entered on the ship’s manifest (which we commonly refer to as a passenger list). How the name was entered when the immigrant left their country is how the name was received at the incoming arrival port. Sometimes an immigrant deliberately falsified their name and arrived under the name of someone else. Often these falsified arrival names were changed by the immigrants themselves later in life, such as when they applied for naturalization papers, or some form of pension, or they wanted to vote in elections. If an immigrant's new name did not match that shown on their official immigration record such as a ship's passenger list, he or she might face difficulties voting, in legal proceedings, or naturalization. One of the most common reason that an ancestor's name on the manifest does not match the surname your father and grandfather have used, is that it was a name unfamiliar to English speaking clerks, and was entered phonetically in other documents, such as census records. For example the surname Przybyszewskl is not only challenging for North Americans to spell, but also to pronounce. It can easily be incorrectly recorded and eventually may become the standard and new name. Sometimes an immigrant chose to "Americanize" their surname themselves and simply began using a new name a year or so after settling in America. Americanizing a surname usually meant making it more familiar to English speakers and spellers. Many of these Americanized names were simply shortened from their original version, for example Kohnovalsky could become Cohn. First names can also be inadvertently or intentionally changed by the immigrant himself or by a clerk recording the name phonetically. My husband’s Belgium born great grandfather’s name was Archie. Or so we thought. But baptism records in Belgium proved it was Achilles, which is pronounced Aw-shee. That sounds like Archie and so he became Archie to his friends in his new land of Canada. Names in other countries and non-English languages are often changed to their English equivalent. My sister’s father-in-law was baptised as Waclaw in Poland. He is found under that name on his 1927 passenger list. But one year later he was recorded under the English equivalent of Walter as he crossed the border from America to Canada. Another reason why an immigrant’s name can be different than his birth name is when a nickname was the name given by the immigrant himself. My grandmother’s original legal name was Ruth, but her family called her Dolly. She gave that name on official records but it was her decision, and was not arbitrarily assigned to her by immigration officials. My husband’s grandfather was Leon Thomas but he was always called Charlie and was the name he used on all official documents. Below are some sample letters representing typical cases of immigrants who made their own decisions to change their surnames. Well, it really isn't hidden but most people wouldn't think to look for it. If you want to merge two files then you will want to read this first. Go to the Help File and type in the word Merging. You will see two entries. The summary list makes a great checklist and the regular best practices entry contain the step by step instructions. When you get to the part where you need to actually merge individual people, you will want to go back to the Help File and type in the words How to. Now click on Merge Duplicate Individuals. There are a couple of links on this pages that you will want to read. Now type the word Merge into the Help Index. Knowing what all of the options on the Merge screen actually do will give you better results. It is VERY important that you understand how merging works before you try to do it because it can really mess up your file if you don't know what you are doing. That is why it is also VERY important you make a backup before you get started. Legacy will also make an automatic backup for you if you have this selected in the Options menu. This will give you an Undo Merge button on the main toolbar/ribbon if you make a mistake. I've been on an incredible genealogy high this week! And it has everything to do with my first DNA tests. If you missed it, the results of my DNA tests were unveiled, both to me and to a live webinar audience, this past Tuesday. Thousands of you have now tuned in and shared in the amazing discovery. I truly had no idea DNA testing could find what it did. I'm finally starting to get the hype - this really is the hottest thing in genealogy. It's not that I've been in my own sheltered world trying to avoid DNA because I have been involved in it. 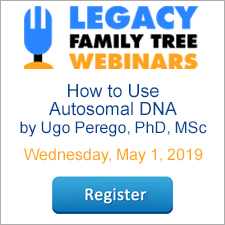 In fact, I've now hosted nine full-length webinars (www.familytreewebinars.com/dna) teaching people about its value to our research. But it wasn't until I actually had my family tested that it has become so real. Finally. So it seems that we still have a ways to go in this field, but it's incredible where we are now. Here's what I learned from my first test. To clarify, it was my mother's parents who were tested, and it was their autosomal DNA from AncestryDNA that was tested. The easiest part was getting them to spit into the container. The hardest part was waiting the one month and 14 days for the email that said the results were in, and then the additional 1 month and 9 days I waited to explore them with you. I learned about Grandma's ethnicity - she was 100% from Europe. My theory has been that if Grandma's DNA matched the DNA of a descendant of either John or Griffin, then at least I know for sure that they are indeed related. Diahan, my on-air DNA consultant, suggested that I do a search in my DNA matches for any Brown surnames who were born in Pennsylvania. ...and compared him with the details of my John Nelson Brown. Their names, dates, and places all seemed to match. Then Diahan suggested that I click on the Shared Matches button. This shows DNA matches that Grandma and John have in common. One match appeared. Reviewing it, my heart seemed to beat right out of my body, and I literally began to be light-headed. If I understand correctly, here's what all of this means. John Nelson BROWN shares DNA with Griffin BROWN, both of whom also share DNA with my grandmother - Virginia BROWN. Therefore, somewhere, somehow, both John and Griffin fit into the family. And with all of the genealogy research I've already performed, it now looks more likely than ever before that they really are children #1 and #3 of Asa Brown's family. And I thought I'd never find the proof! While DNA will not tell me that "Griffin is the son of Asa" I'm now as excited and energized as ever to continue pursuing this family. I am on the right trail. Hundreds of you have personally written to me (thanks!) to congratulate me on these findings. Many of the messages have suggested that this discovery was somewhat unusual, even ideal. Maybe it was beginner's luck, but I feel there were some factors that contributed to this success. First, I was fortunate to have my grandmother perform the DNA test. Had I only tested myself, and since I only have 25% of my grandmother's DNA, there's a 50% chance that the DNA which matched John and Griffin wouldn't have been passed to me, and I would not have made this discovery. Second, not only did I have part of my tree at Ancestry, but both the descendant of John and the descendant of Griffin also had partial trees at Ancestry. With the combination of that and our DNA match, we discovered each other. 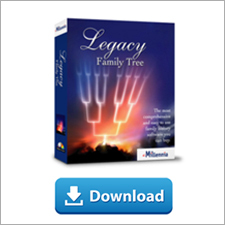 I will continue to keep the master copy of my tree in Legacy for all of the advantages it gives me, but recognize the benefits of having parts of it online. Third, my genealogical research of both John and Griffin was very thorough, which permitted me to recognize the potentially matching names, dates, places, and relationships. Never be satisfied with a partial family! Fourth, not only did the descendant of John and Griffin have a tree at Ancestry, but they also participated in DNA testing. Fifth, the guidance I received from Diahan was invaluable to understanding and filtering through the results. If you've tried interpreting your DNA results on your own, I'd strongly recommend that you visit with her through her consultation services or learn from her via her inexpensive DNA reference guides. I'm still a little overwhelmed with the results, and this was just my first test! Here's what I plan to do next. If you have other suggestions, I'd love to hear from you. I've ordered another DNA test, this time for my father's 93-year-old father. It should arrive in the next day or so, and then I've got another excuse to make the 3-hour drive to visit him. I'll probably spend most of my time looking for more evidence of John and Griffin. I look forward to that day when I can, with full confidence, link them to their correct places in my tree. I'm more confident with DNA testing now, but I will definitely review these two reference guides by Diahan: Autosomal DNA for the genealogist and Understanding AncestryDNA. I should probably also review Getting Started: Genetics for the Genealogist. Import my AncestralDNA results into FamilyTreeDNA. Transferring costs about $39 and from what I hear there are additional benefits by having the results there too. Import the results into GEDMatch. This is free, and provides additional tools such as comparing my results with others who may not have had their tests done with AncestryDNA. Against others' recommendations, I'm going to have myself tested sometime. I've got to prove to my parents that they didn't find me under a rock. And who knows what else I'll find? I'd also like to have my wife's parents tested. I've done a little bit of research on my father-in-law's line, and feel this could help with some of the challenges. So if you've read this far, and you haven't yet joined this new world of DNA testing for genealogy, I hope I've inspired you a little bit. At the very least, I've now got a summary of what I did and a checklist of where I'm heading - both good practices for genealogy research of any kind. Nothing hits me in the gut more than knowing that a direct ancestor of mine spearheaded an Indian massacre. In January 1863, Colonel Patrick E. Connor and his regiment wreaked havoc at Bear Creek in southeastern Idaho, resulting in hundreds of casualties for the Shoshoni Indian Tribe and their families. Being descended from a decorated war hero, to whom I owe my middle name, does not generate the feelings of pride or excitement it once did. However, the relationship of Americans and indigenous tribes was complex to say the least. Without disregarding the atrocities committed by General Connor, Americans settling out west were victims of raids and brutality by the Western tribes as well. This article is not meant to debate the ethics of one side against the other, but rather to briefly demonstrate how research, thus adding historical context, gives us a fuller understanding of our ancestor’s lives and their actions. Whether we're dealing with the more light-hearted fare of day-to-day life or events that taint our family history, adding historical context is an important process to bring us closer to our ancestors. The world of genealogy is catching on to this with great interest; more and more researchers are looking for ways to add “meat on the bones” and to bring to light the time-period of their ancestors and what their experiences were like. When we research the history around our ancestors, they become more than names on a branch, but people with a story to tell, that can captivate you, your family, and future generations. My experience in genealogy has proven repeatedly, that our history textbooks from grade school overlooked the amazing history retold through the stories of everyday people. We often find clues in our sources that probe us to ask, “Why did they do that?” or “Why did this happen to them?” At our disposal are voluminous resources that we can use to answer, or at least come closer to answering, these questions. Newspapers are a great primary source for investigating historical events and they help to demonstrate the character of a particular community. Not only do they provide primary accounts of important moments in our ancestors’ lives, but they also capture the opinions and sentiments your ancestor may have held towards particular social issues. The first place I’d look for links to online newspapers databases is FamilySearch Wiki’s article, "Digital Historical Newspapers” or Cyndi’s List. Also, visit Kenneth Mark's Ancestor Hunt website which provides tremendous resources for newspaper research. There are also over 15 "always free" classes on newspaper research by Tom Kemp inn the Legacy Family Tree Webinars library. A lot of great study has been devoted to understanding life at the workplace. Try researching the history of a specific job like coal miner or a particular company, i.e. the Boston & Maine Railroad Company, to find collections and sources that provide insight into the day-to-day life of your ancestor at work. If your ancestor was a veteran, there are abundant websites and records documenting the activities of your ancestor’s company or regiment to help better understand their experience on the battlefield. I would start by searching your ancestor’s regiment or company because there is a very high chance somebody created a webpage on it, or you can go deeper using records of the National Archives. The document below shows Colonel Connor’s own account of the Massacre at Bear Creek, extracted from a large series of reports and correspondence published as The War of the Rebellion. Accessing the articles written by scholars and historians is a great way to add historical context. Less focused on genealogical research, scholarly articles can provide fuller understanding on a variety of historical subjects, i.e. the witchcraft hysteria in New England or social conditions of Irish-Americans in urban communities. These academics have gone to great lengths to pull together a variety of primary and secondary sources to give a more balanced view of history. Pertinent databases include JSTOR, Google Scholar, and Academic Search Complete by EBSCOhost. Some are free, while others require subscription access. Check your local library or university to inquire about what research databases are available within their network. Even if family treasures like diaries and letters do not exist in your family, consider reading those of other families that relate to your research. The farther back in time we are researching, the more important these primary sources become in determining what might have been our ancestor’s thoughts, feelings, and aspirations in their day to day lives. Many have been published and edited with commentary, like The Prendergast Letters: Correspondence from Famine-Era Ireland or One Colonial Women’s World: The Life and Writings of Mehetabel Chandler Coit, while others still lie in the stacks of archives. To track down some of these, try the National Union Catalog of Manuscript Collections or ArchiveGrid by WorldCat. These are excellent catalogs to begin archival research. Add some fun to your family history journey and enjoy a visit to a museum! Particularly in ones that offer living history settings, like Plimoth Plantation, the past surely does come alive. Museum guides, re-enactors, and collections on display provide a window into life as it once was. Something about experiencing history first hand cannot be recreated in any type of source or record. As a bonus, visiting a museum is a great field trip for the whole family to take, so everyone can better understand and appreciate the lives of our ancestors, but most importantly, all of the great work you as genealogists do in preserving the legacy! Hear are a few examples of digital libraries and archives that could help with providing historical context, along with resources that provide links to some of these repositories. "American Memory." Library of Congress. “Colonial North American Project.” Harvard University Library. “Documenting the American South.” University of North Carolina – Chapel Hill. ”Digital Collections.” Library of Congress. Nancy E. Loe. “States on Sunday Archives.” Sassy Jane Genealogy. A growing collection of free digital archives by State. “Primary Source Sets.” Digital Public Library of America. Staff Writers. “250 Plus Killer Digital Libraries and Archives.” Open Education Database (oedb.org), posted 25 Mar 2013. United States. War Dept; et.al. The War of the Rebellion: A Compilation of the Official Records of the Union and Confederate Armies. (Washington, D.C.: Govt. Printing Office, 1900), 187.